This post probably isn’t going where you think it is from the title. We’re not going to be talking dieting. No way Jose. But there is a slight double meaning in the title – as it will be the first time I have uploaded a video of my fridge – so you can ‘watch’. (Fridge Vlogs, how will I top that going forward? *said with immense British sarcasm*). – it’s actually shot on Thursday but you’ll get the gist. So, what is today’s post about? Being Mindful. That’s this weeks theme. I posted about remembering to be mindful on Tuesday and it started the cogs whirring. Mindfulness is a practice, that can be incorporated into all aspects of a simple deliberate life. Take my fridge for example. On the whole (but hey no-ones perfect 24/7) I know what is in my fridge, to which dishes the items are headed, and what I am going to replenish the fridge with, as part of my Friday routine. I’m paying attention to what I buy, what I use and what I eat. Once this Friday fridge is accounted for (see video) I’ll be buying what I need based on a meal plan for next week. I love meal-planning. Paying attention works when looking to limit food waste, reduce grocery spend, and ultimately when you want to watch what you eat. Thanks to everyone who commented last Friday with suggestions on how to use up the items in my chaotic fridge. Admittedly last week wasn’t a great example of being mindful and paying attention. As always I love to hear what you have to say on the subject of reducing waste. Please do talk to me. If I can shoot a video (very scary), maybe you can post a comment? And no, I haven’t forgotten – here’s my food waste photo. 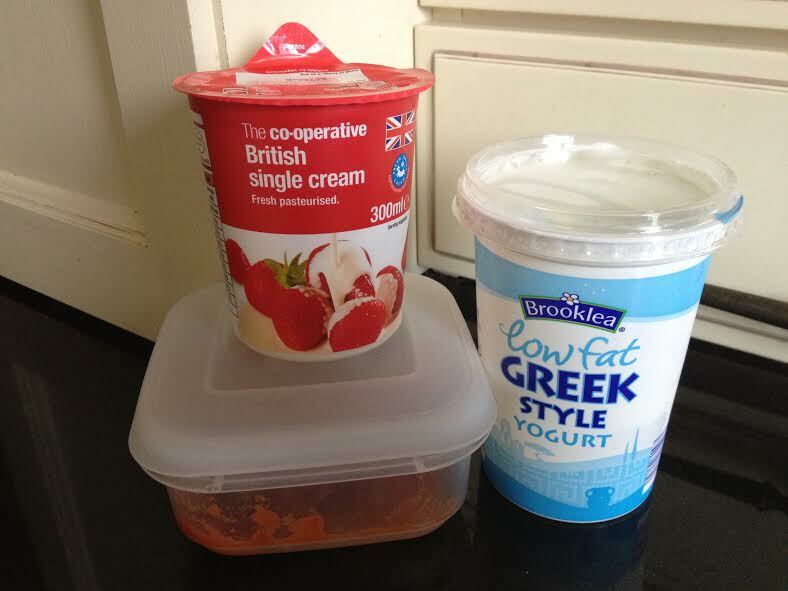 A couple of tablespoons of cream, yoghurt and salsa. Bad girl. How’s your Friday fridge looking? Packed to the rafters or nice and bare, please share. 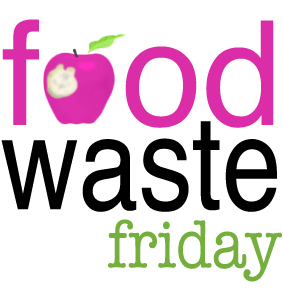 Thanks as always to Kristen, The Frugal Girl, (the founder of Food Waste Friday and the inspiration behind No Waste Tastes Great)…Don’t forget to head on over to her’s to link up your Food Waste Friday post! This was my first week of “officially” accounting for my waste and writing about it on my blog. As I am a new blogger this is the first chance I have had to actually publicly declare waste. I had an awesome week, very little waste. This is because I have been following Food Waste Friday for some time on my own at home. Thanks for inspiring me to do open up about this issue. Hi Vicki – so please to see you over here. Will pop over to yours. That chocolate pud looked good from the last time I visited! Thanks! I heard yours when you were interviewed! Good idea with the salad leaves. Lovely to hear your voice! Your North American readers are in for a treat. We have been challeging ourselves with packging waste and had a lot of success, and some failures. I won’t bore you but we are enjoying it all the same. My aldi hasn’t got that pizza base which is a shame!! There was a guy on radio 1 the other day doing regional accents. It is so strange how in such a small area we vary so much. Brummies are about 100 miles away from scousers and yet the difference is immense. Your Dog sounds very effective at reducing waste! We have fish and hamsters – not so effective. ps – I loved Brookside! Bring back Jimmy Corkhill! Loved the video! I wish my fridge was looking as empty as yours! I loved hearing your voice and you did a wonderful job on your first vlog entry. I’d imagined you sounding like my Cumbrian friends, but there’s a subtle difference to your accent. I should have gone into linguistics – for some reason the differences in accents fascinate me! We are doing a big food shop tomorrow, but more and more over the past several years we’ve become much more careful in what we buy, both quantity and quality. We will be going to the Amish market tomorrow where I love to buy chicken; local, free range, carefully raised and fed, and you can tell the difference in the flavor of the meat. Not much waste over here on this side of the world. I think we are going to have some yoghurt too as I had to buy a big container and I don’t thing Alex will use it all up in time (he is only little, but they were out of his usual pots! ), and we have been given a heap of satsuma’s from our neighbour and I’m not sure how we can possibly eat them all! Might have to get the hubby to take them to school and palm them off on one of his bands 🙂 Otherwise, I actually had to go our and buy more vegetables because I used them all up too early! Not sure whether that is a win or just poor shopping planning… 🙂 More videos please! You sound so lovely and gentle.